The Business Unit Liquid Purification Technologies (LPT) of specialty chemicals company Lanxess is one of the most important suppliers for liquid separation procedures worldwide. It holds a leading position in the development and production of ion exchange resins and is strongly committed to the further development of reverse osmosis membrane elements. 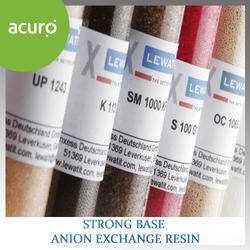 Ion exchange resins are used to remove dissolved particles from liquids. Therefore, functional groups are bonded to the polymer beads. These functionalized polymers adsorb particular anions or cations from the liquid and discharge others. Water treatment is the best-known and biggest field of application for ion exchange resins. In household, such applications are used among others to soften water. They ensure that the calcium ions responsible for water hardness are replaced by sodium ions. Ion exchange resins are also used in industry, for example in power generation. There, Lewatit is used in the production of ultra-pure boiler feed water and steam to avoid incrustations and corrosion. This improves the efficiency, operating reliability and lifetime of power plants. In the cleaning of industrial effluent and treatment of groundwater, the removal of toxic substances plays a key role. Lanxess has a range of special Lewatit resins that, are able to selectively remove, for example, heavy metal ions and organic pollutants from (waste)water. Other fields of application for ion exchange resins include semi-conductor production, galvanic industry (recovery and treatment of metals such as gold, copper, nickel or cobalt in hydrometallurgy), pharmaceuticals, the food and beverage industry. In the production of crystal suger and liquid sugar syrup, Lewatit allows the brown cane sugar to be turned into the beloved white product and ensures that sugar also tastes like sugar. 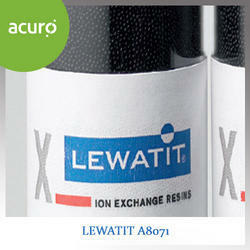 Lewatit ion exchange resins are also reliable catalysts which are crucial for many chemical reactions. 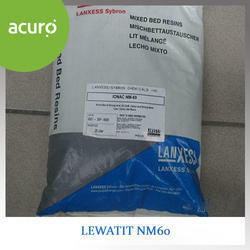 Lewatit® NM-60 is a highly regenerated mixed bed ion exchange resin consisting of a 1:1 chemically equivalent mixture of a type 1, strong base anion exchange resin and a strong acid cation exchange resin. Lewatit® NM-60 is specially treated for high conversion and low TOC to meet the most exacting standards of high purity water industry.The resin mixture is ready for the use without regeneration. Lewatit® C 249 is a premium grade, standard cross-linked, gel, strong acid cation exchange resin based ona styrene / DVB polymer. Lewatit® C 249 is especially suited for industrial water treatment applications,including demineralization, service exchange, and softening. 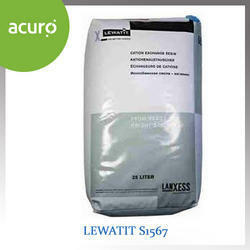 Lewatit® C 249 can be used in single bed andmixed bed applications. Lewatit® C 249 exhibits a high ion exchange capacity combined with excellentmechanical and osmotic strength for a long operating life. Lewatit® C 249 is supplied in a heterodispersedparticle size distribution as spherical beads in the fully swollen moist sodium form. Lewatit® C 249 isprepared with a minimum amount of fines (-50 mesh particles) resulting in low pressure losses duringservice.Lewatit® C 249 is supplied in the sodium form. 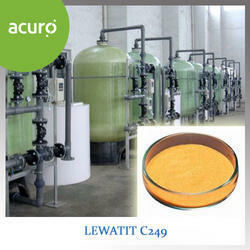 Lewatit® C 249 is also available in the hydrogen form,designated as Lewatit® C 267. Lewatit® ASB 1 is a premium grade, gel, strong base, Type 1, anion exchange resin based on a styrene /DVB polymer. Lewatit® ASB 1 is especially suited for high purity separate bed, or mixed bed applications,where silica reduction in the final treated water is a critical requirement. Lewatit® ASB 1 exhibits a high ion exchange capacity combined with excellent mechanical and osmotic strength for a long operating life.Lewatit® ASB 1 is supplied in a heterodispersed particle size distribution as spherical beads in the fully swollen moist bead form.Lewatit® ASB 1 is prepared with a minimum amount of fines (-50 mesh particles) resulting in low pressure losses during service.Lewatit® ASB 1 is supplied in the chloride form. Lewatit® ASB 1 is also available in the hydroxide form, designated as Lewatit® ASB 1 OH. 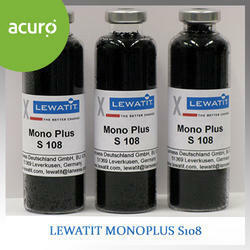 Lewatit Monoplus S 108 is a strong acidic, gel-type cation exchange resin in the Na-form with beads of uniform size (monodisperse) based an a styrene-divinylbenzene copolymer. Due to a special manufacturing process this resin type is extremely resistant to chemical, osmotic and mechanical stress. That leads to very low reachable even under critical conditions like higher temperatures, presence of oxidants (02, Fe-oxides) and external regeneration processes. Even at very short cycle time(one-cycle = service + regeneration) the special ion exchange resin matrix leads to long life cycles in demineralization processes. The high total capacity results in high operating capacities with a very low ionic leakage and a very high regenerant utilization. The extremely high monodispersity coefficient : 1.05 (+/- 0.05) and very low fines content of max 0.1% (<0.4 mm) results in particularly low pressure losses paired with an efficient and cost optimised operationof demineralization plants. 1.Demineralization of water for industrial steam generation operated with co-current or modern counter current systems like e.g Lewatit WS System, Lewatit Liftbed System or Lewatit Rinsebed System. 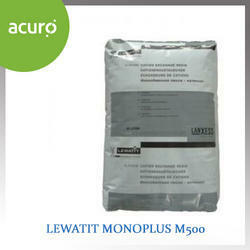 2.Polishing using the Lewatit Multistep System or a conventional mixed bed arrangement in combination with the following anion components : Lewatit Monoplus M 500 MB,Lewatit Monoplus M 800 , Lewatit Monoplus M 600, Lewatit Monoplus MP 500, Lewatit Monoplus MP 800 and Lewatit Monoplus MP 600. Looking for Lanxess Resins ?